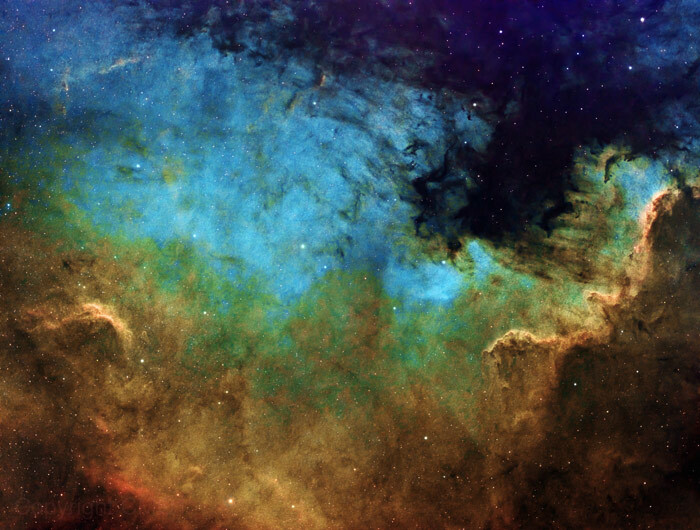 North American Nebula (section), Narrowband by AstroBin user Chris Owen. All rights reserved. Used by permission. Tele Vue-85 APO refractor with TRF-2008 0.8x Reducer/Flattener (480mm f/5.6) with ZWO ASI1600MM Pro camera on iOptron iEQ30 Pro mount. Taken through Astrodon Hα, OIII, and SII filters for a total integration time of 4.5-hours. The often imaged North America Nebula glows from ionized gas (like a neon light) powered by photons from nearby stars. The colorful detail section shown is known as the “Cygnus Wall” that includes “Mexico” and “Central America.” This rendition is rotated with the “Gulf of Mexico” being the deep-blue region at upper right with the “Panama Canal” split below it. Clouds of dust and gas billowing along the “Pacific Coast” form a dense star-forming region. This level of detail can only be revealed using narrowband filter imaging that highlights differences in the chemical composition of the dust and gasses in the nebula. 20-years later my wife decided to surprise me with a telescope for our first Christmas and called my father for advice. He had since discovered the advantages of wide-field refractors and he answered without hesitation: I found a Tele Vue-85 under the tree for Christmas 2015. The crisp, high contrast image struck me on my first terrestrial views through the little scope. Before long I had an iEQ35 pro mount, starshoot autoguider, a Canon T5i and some halfway decent shots of the great nebula that had eluded me on those cold nights years ago. Rosette, Narrowband by AstroBin user Chris Owen. All rights reserved. Used by permission. Tele Vue-85 APO refractor with TRF-2008 0.8x Reducer/Flattener (480mm f/5.6) with ZWO ASI1600MM Pro camera on iOptron iEQ30 Pro mount. Taken through Astrodon Hα, OIII, and SII filters for a total integration time of 9.5-hours. 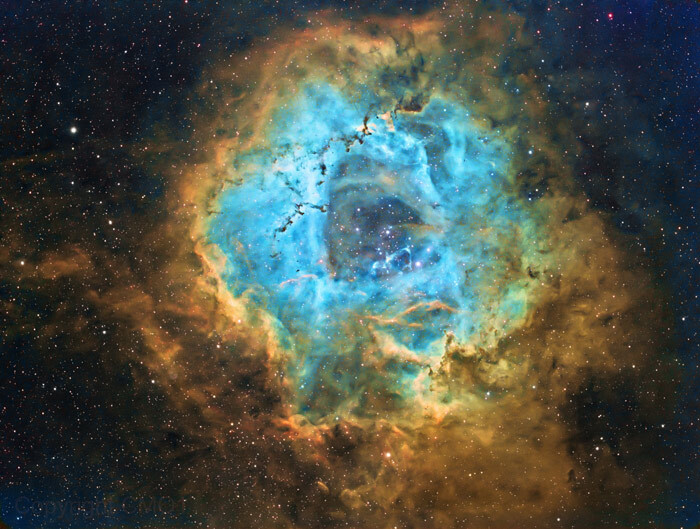 This eye-grabbing depiction of the Rosette Nebula demonstrates the ability of narrowband imaging to convey a startling dimensional quality to distant objects. The layers of color revealed by combining the narrowband sub frames draws the viewer from the ruddy edges of the nebula into the aqua-colored center and then out the “back” aperture of the structure. I shoot now from my backyard in coastal Southern California. Last year I made the transition to narrowband imaging and a cooled CMOS imager (ASI1600M Pro). These images are from my first season with the new imager. The Tele Vue TRF-2008 0.8x Reducer/Flattener gives a perfect field on the APS-C sensor and focusing is easy. The narrowband filters cut through the light pollution and the wide field/low power of the ’85 means I don’t have to worry about the seeing here, which varies a lot with the marine air mass. The wide field is also nice for mosaic shots. A panorama from the Horsehead to M42 fits into just 3 fields of view with enough overlap to stitch the frames without too much artifact. I use the mosaic wizard in Sequence Generator Pro to set up the shots and shoot over several nights. Horsehead and M42, Mosaic by AstroBin user Chris Owen. All rights reserved. Used by permission. This is a three panel mosaic image. Tele Vue-85 APO refractor with TRF-2008 0.8x Reducer/Flattener (480mm f/5.6) with ZWO ASI1600MM Pro camera on iOptron iEQ30 Pro mount. Taken through Astrodon Hα filter for a total integration time of 4.8-hours. This Hydrogen-alpha narrowband filter image exploits a wavelength of hydrogen light abundant in ionized nebulae and stars. The result is a stark, high-contrast image of objects against a black sky. On the far-left-side is the Flame Nebula (NGC 2024) that is “lit up” by the easternmost star in the belt of the constellation Orion. The dramatic “flame-like” appearance is created by dark “branches” of light-absorbing gas. Just to the right of the Flame is the Horsehead Nebula (Barnard 33), formed from ionized gas glowing behind a dark concentration of dust that looks like a horse’s head. On the far right is the Orion Nebula (M42) – a massive region of star-formation. The multitude of bright new stars in this cloud light up the gas in the nebula. 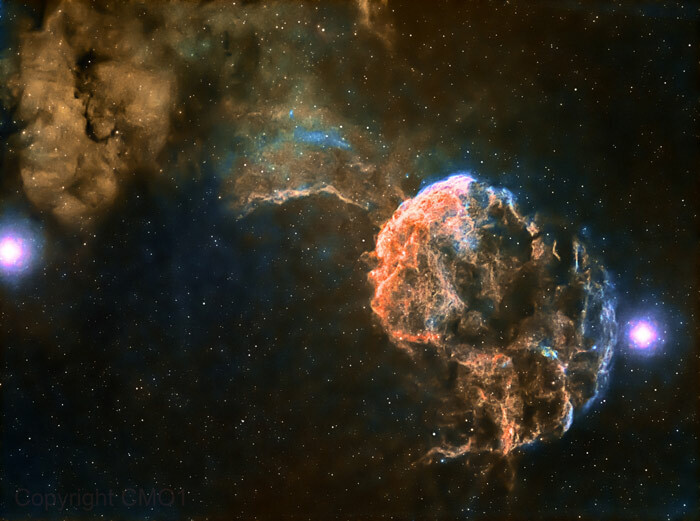 California Nebula in SII and Hα, Mosaic by AstroBin user Chris Owen. All rights reserved. Used by permission. This two-panel mosaic was created with the Tele Vue-85 APO refractor with TRF-2008 0.8x Reducer/Flattener (480mm f/5.6) with ZWO ASI1600MM Pro camera on iOptron iEQ30 Pro mount. Taken through Astrodon Hα, and SII filters for a total integration time of 6.7-hours. Pinkish and aquamarine cotton-candy hues clash in this bi-color image of the California Nebula (NGC 1499) in the constellation Perseus. The light emitting gas in the nebula is powered by the nearby blue-giant star Menkib. I use Astro Pixel Processor to process and stack the subs. It has a very powerful mosaic tool which can normalize values and create seamless compositions from lots of subs over many nights. For final processing I try to use the “tone mapping” technique developed by J-P Metsavainio. The narrowband data gives tremendous latitude for color interpretation and level and curve adjustment to determine the final overall feel of the image. It is a constant struggle to maximize the detail in the data without introducing noise, artifact or over-processing. With each image I gain new appreciation for the artistry of master imagers like J-P. The Tele Vue-85 at the heart of my set-up makes it easy to soak up more data and continue my efforts. Available in ivory or green OTA (above shown with optional accessories). 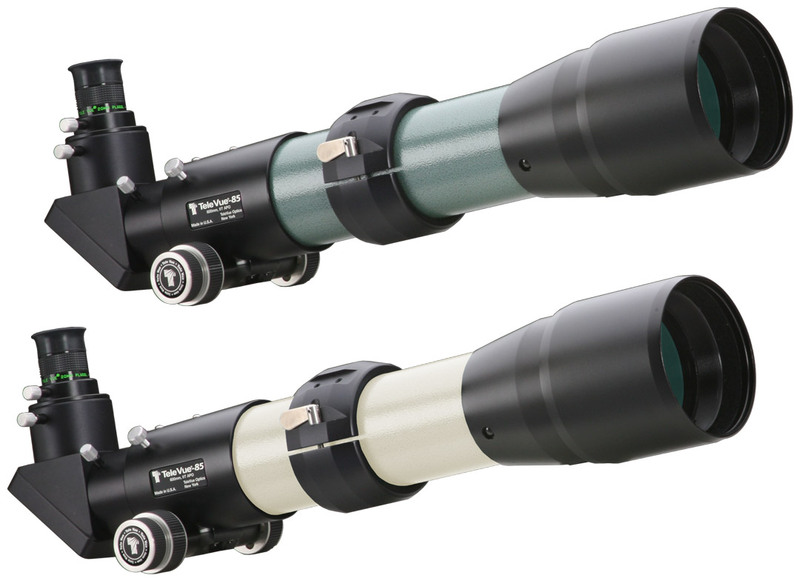 The OTA includes: sliding metal dew shield, screw-on metal lens cover, Focusmate dual-speed 10:1 focuser, and soft carry case. Optional accessory package (TVP-3373) includes tube ring-mount with mounting threads, 2″ Everbrite (99%, 1/10-wave) mirror diagonal with brass clamp ring, a 1¼” ‘Hi-Hat’ eyepiece adapter with brass clamp ring, and 18.2 DeLite eyepiece with 20-mm eye-relief that yields 1.8° true field of view at 33x in this scope..
With an 85-mm APO (Doublet) objective and 600-mm focal length, this f/7 refractor offers a combination of optical performance and airline portability that delights amateur astronomers, birders, and reviewers alike. Resolving close double-stars, viewing lunar detail, viewing deep sky, and photographic uses were reported in Sky & Telescope as: “Truly awesome! …Incredible!…the view almost blew me off my chair!…” The conclusion, “…an extremely powerful, compact instrument capable of delivering stunning images of the universe.” Maximum field-of-view is 4.4° (with our 41 -mm Panoptic [mobile site] at 14.6x or 55-mm Plössl [mobile site] at 10.8x) allows use as a self-finder. 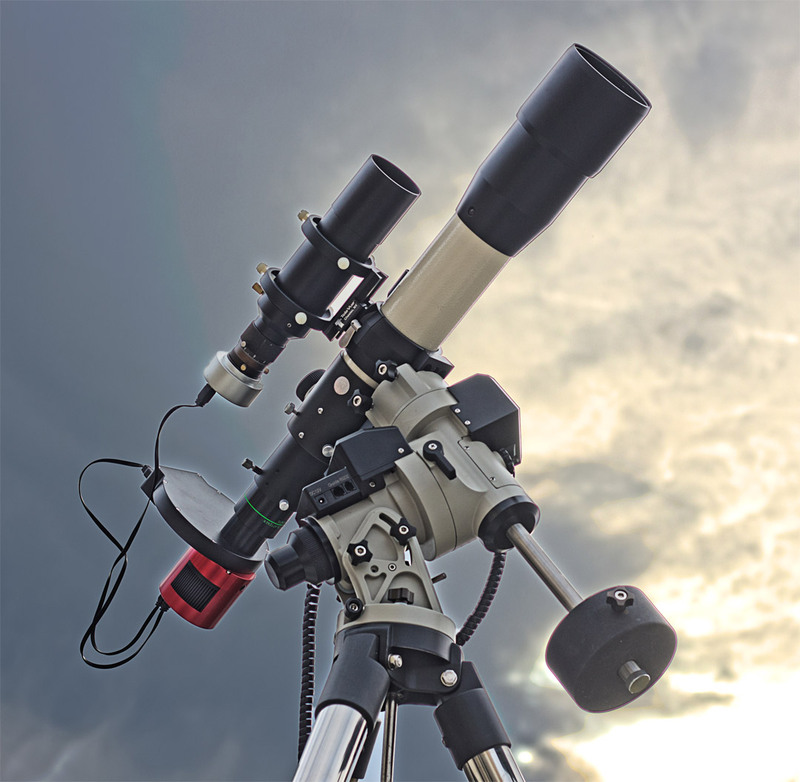 Optional Nagler 3-6mm Planetary Zoom (mobile site) yields 100x – 200x in this scope for obtaining optimal planetary observing power to match the seeing conditions. The addition of the TRF-2008 0.8x Reducer/Flattener (mobile site) converts the Tele Vue-85 to 480mm f/5.6 for flat field, fast photography with any camera that accepts a T-Ring. See more info on the Tele Vue-85 page (mobile site). Chris’ Tele Vue-85 setup for astro-imaging. Chris Owen image. All rights reserved. Used by permission. Taking advantage of the Tele Vue-85’s ability to work as a high-end, prime, telephoto lens, Chris also provided us with these birding images. 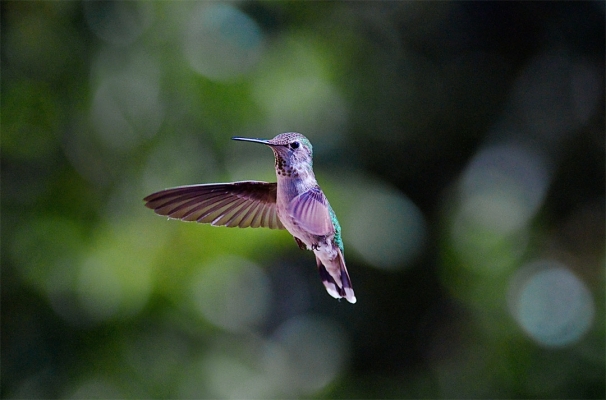 Hummingbird taken in Marin County, CA with Tele Vue-85 and Canon T5i without reducer / flattener. Chris Owen image. All rights reserved. Used by permission. Owl taken in Marin County, CA with Tele Vue-85 and Canon T5i without reducer / flattener. Chris Owen image. All rights reserved. Used by permission. 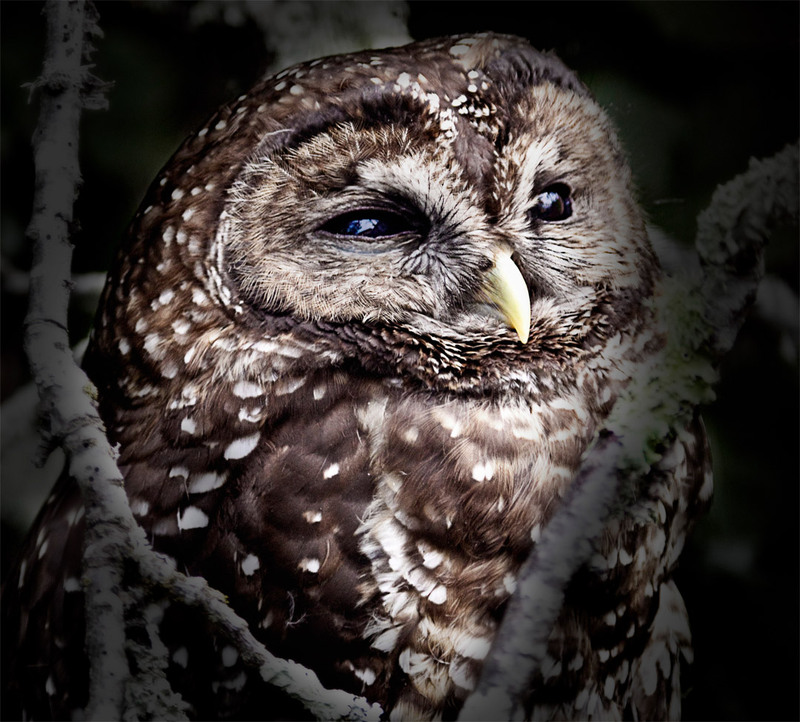 To learn more on using the Tele Vue-85 or our other small APO scopes for birding please visit our Birdscope website. Previous Previous post: This Week: London Calling!